I follow a lot of blogs, but there are a few that I always click on when a new post pops into my reader, Joy the Baker is one of them. Short, sweet and funny posts and delicious recipes with a twist like this avocado cake and this almond granola. 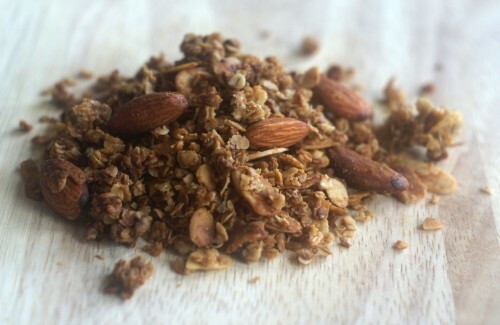 Full of almonds, coconut, honey, cinnamon and vanilla – this is a good granola. I made tonnes of it for Breakfast Club guests to take home, thankfully there was enough left for me. I love granola with warm milk so it softens slightly and the milk becomes nice and sweet, but it’s also lovely with yoghurt and fruit. Mix the oats, flaked almonds, raw almonds, desiccated coconut, cinnamon and salt together in a bowl. Heat the butter, sugar and honey together in a large saucepan until everything has melted and the mixture is smooth. Stir in the vanilla. Remove the pan from the heat and tip in some of the oat mixture. Give it a really good mix, so that the oats are well coated. Continue adding the oats, a little at a time, stirring well, until you’ve added all of them. Tip the mixture into two large baking trays and bake for 20-30 minutes. You’ll need to turn the mixture every 10 minutes or so. It’s ready when all the flakes are toasted and golden-brown. 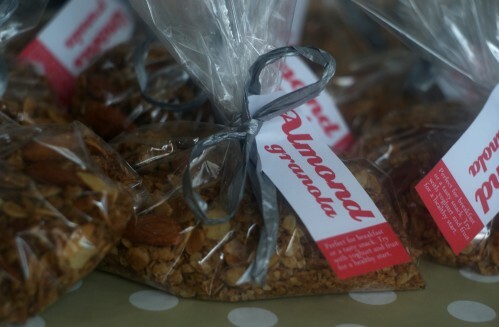 Remove the granola from the oven and allow to cool completely, then store it in an airtight container. It will keep for several weeks, if it lasts that long.